All photos by Bonnie Lane except noted. Hundreds of activists from several Mid- Atlantic states and beyond gathered Julu 12 near the U.S. Capitol reflecting pool before marching to the Federal Energy Regulatory Commission (FERC) The activists do not want Cove Point. Cove Point is an export terminal proposed in Lusby, MD about 50 miles south of the White House which could be exporting Liquified Natural Gas (LNG). Rachel Heinhorst lives in the home closest to the Cove Point site. 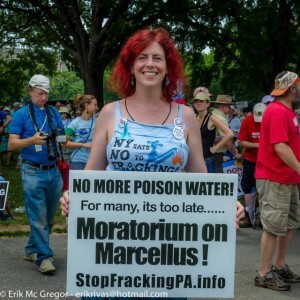 Addressing the crowd, Heinhorst stated, “ I know money is the power behind this project,” she said, “But what about my family and families who have already lost their lives or been displaced because of gas terminals like the one Dominion desires? 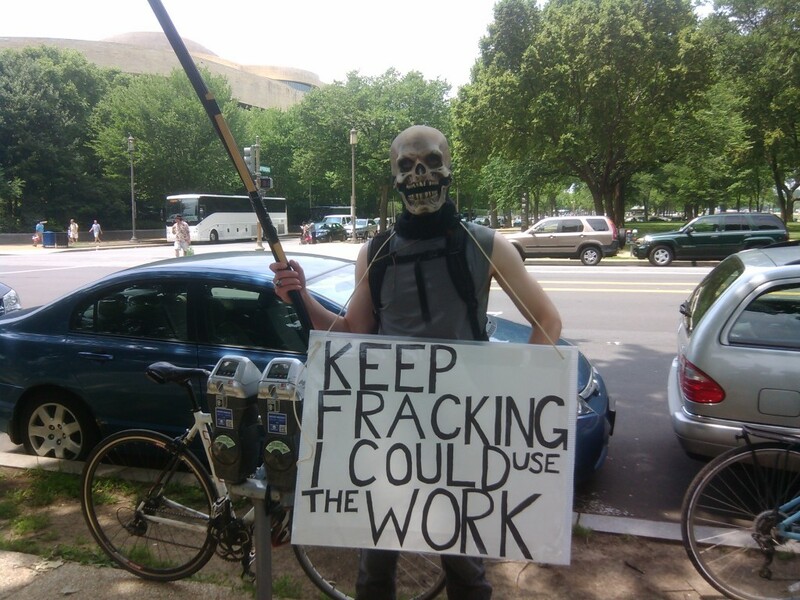 FERC and President Obama, please hear us. We do not deserve to live in fear of an explosion, of the water we drink, of the air we breathe. Heinhorst is the mother of three and a teacher from Lusby. The speakers including Heinhorst had a common theme: FERC is endangering public safety and undermining Obama’s own climate action plan by moving to rubber-stamp LNG export projects without comprehensive reviews of their human health or environmental impacts. 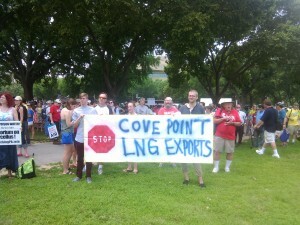 Chants of “ No Cove Point” echoed through the air in DC as people from more than 40 groups marched on to FERC. Many carried signs and banners. Others carried drums and megaphones. The march ended right at FERC. A line of police and homeland security officers formed a barrier between the building and the protestors. Groups who endorsed the July 13th rally included: Americans Against Fracking, Berks Gas Truth, Calvert Citizens for a Healthy Community, Catskill Citizens for Safe Energy, Center for Biological Diversity, Center for Health, Environment & Justice, Chesapeake Climate Action Network, Chesapeake Physicians for Social Responsibility, CREDO, Damascus Citizens for Sustainability, Delaware Riverkeeper Network, Energy Action Coalition, Environmental Action, Earth Day Network, Earthworks, Faith Alliance for Climate Solutions, Food & Water Watch, Friends of the Earth, Greenpeace, Green America, Hip Hop Caucus, Hoho Climate Change, Interfaith Power and Light (DC.MD. No VA) , Interfaith Moral Action on Climate, Marcellus Outreach Butler, Maryland Environmental Health Network, Midshore Riverkeeper Conservancy, Moms Clean Air Force, Myersville Citizens for a Rural Community, No Fracked gas in Mass, Pascack Sustainability Group, PA Alliance for Clean Water & Air, Protect Orange County, Public Citizen, Responsible Drilling Alliance. Roots Action, Roseland Against the Compressor Station, Sierra Club, Stop the Frack Attack. Transition Howard County, U.S. Climate Plan, Waterkeeper Alliance, Waterkeepers Chesapeake and 350.